Fresh flowers and sweet refreshments are the theme for this girlfriend gathering. 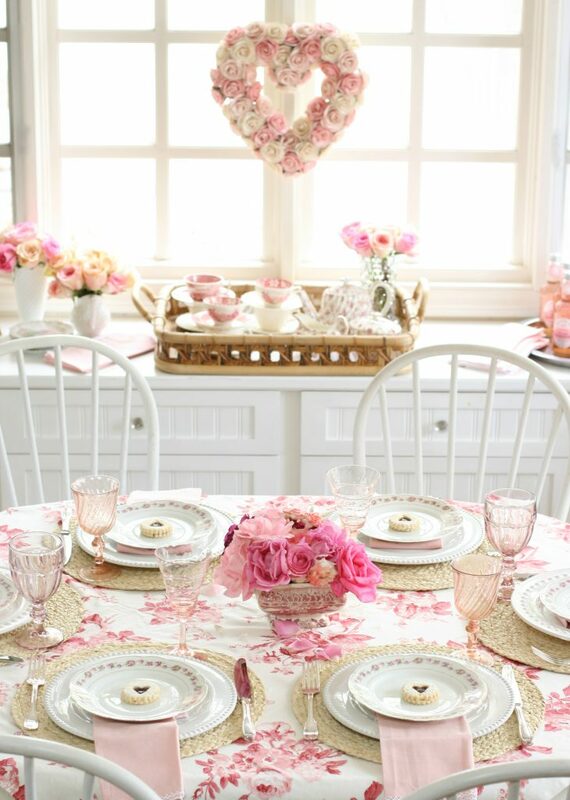 Setting a girly table like this is easy when you remember to include vintage accents, pink tableware, natural elements and lots and lots of roses. Known as Galentine’s Day, this brand-new and completely unofficial holiday is gaining popularity as the perfect opportunity for women everywhere to celebrate friendship. While love is already in the air leading up to Valentine’s Day on February14th, February 13th honors the love we have for our favorite friends. What better way to celebrate than with love’s favorite flower, the rose? Galentine’s Day is a fun excuse to bring your girlfriends together for a beautiful girly gathering. Roses, vintage accents, and natural elements bring this table together with an updated romantic look. Roses. You can never have too many roses! At this table, we’ve brought in old-fashioned garden roses in a vintage red and white transferware tureen as the centerpiece for the table. 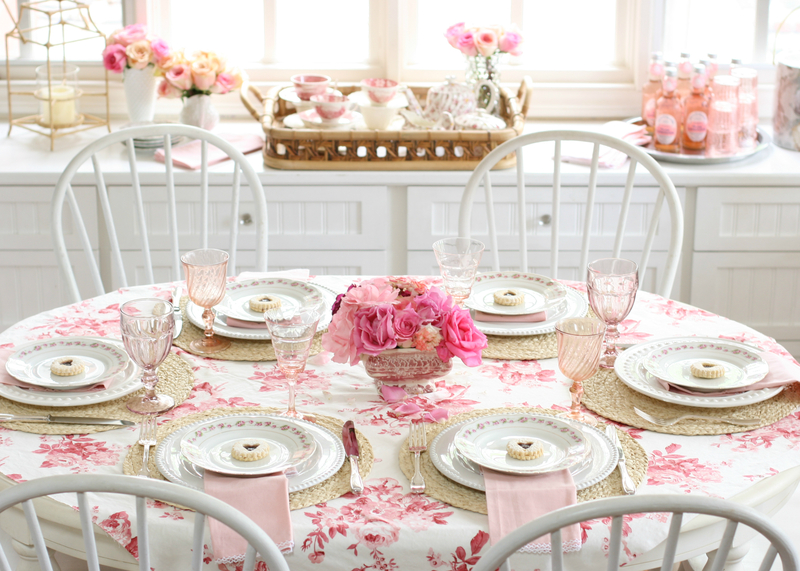 Each guest will feel special sitting at a table set with dainty rose embellished china. 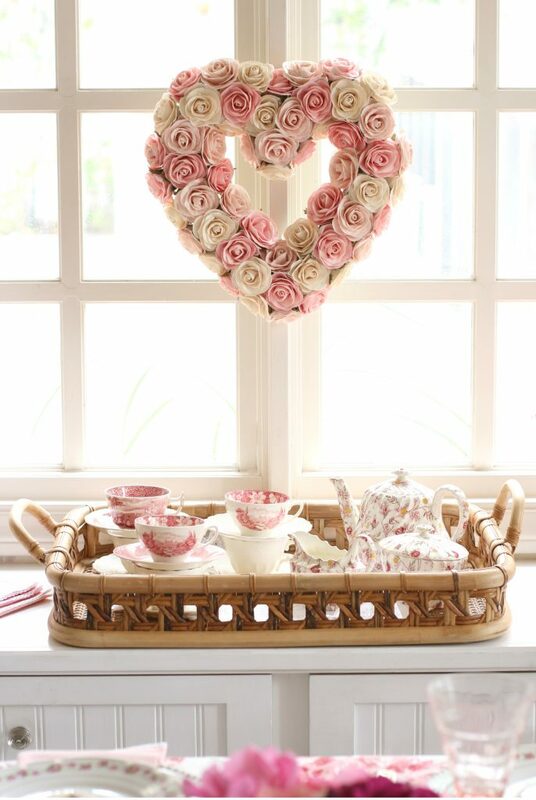 The rose theme continues with a chintz table square and heart-shaped wreath in the window. Soft pink napkins and mismatched vintage glassware compliment the red and white floral chintz tablecloth and add to the feminine charm of the day. Pink. What color can be more girly than pink? Of course, all our roses are various shades of pink, so we’ve also brought in soft pink napkins and mismatched vintage glassware to add that extra sparkle to the table. A simple gathering of a different variety of roses is a special touch and proves to be a pretty centerpiece for the table. Their delightful fragrance also adds to the romantic ambiance at the table. Hearts. Hearts are what bring friends together. 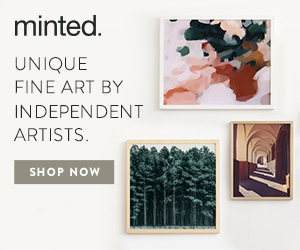 Honor the love you have for your friends with special symbolic reminders of your affection. 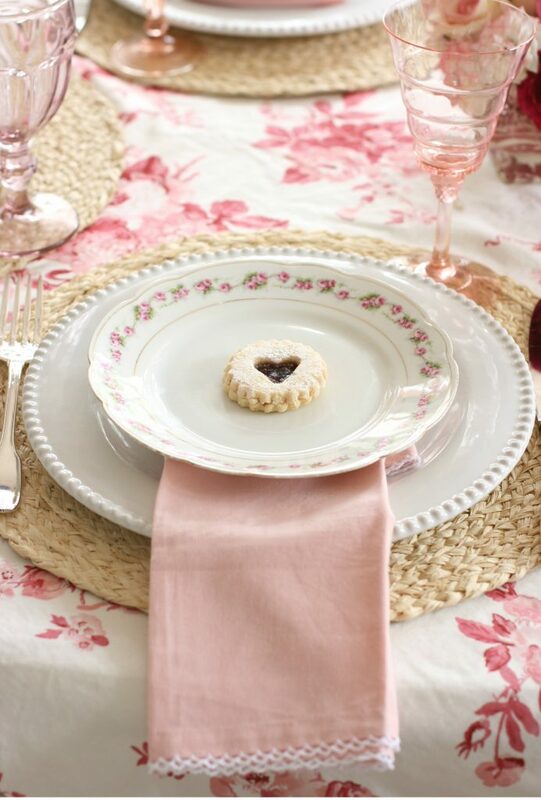 Little Linzer cookies filled with jam are the perfect accent for each place setting. In keeping with the theme of the day, a heart-shaped rose wreath decorates the window. 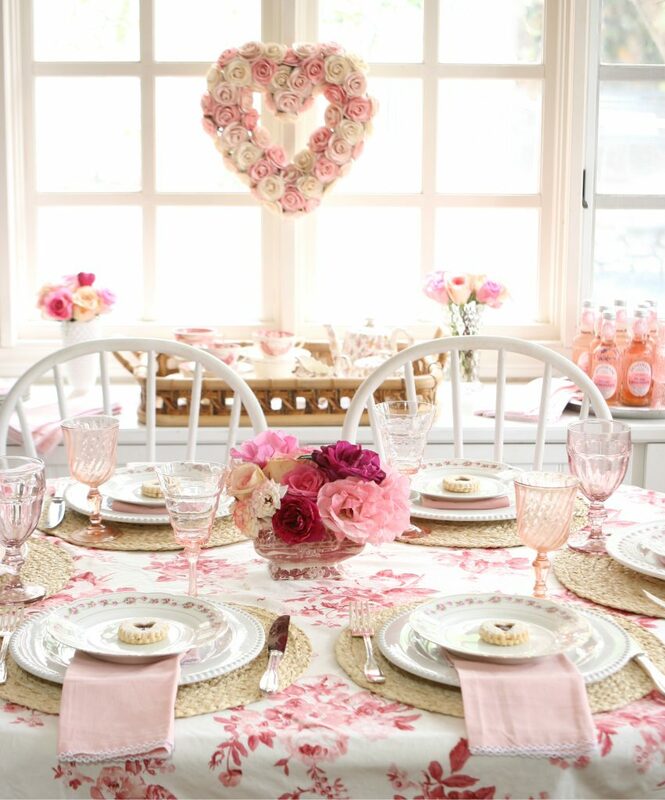 Various shades of pink roses bring the whole look of this table together and is a gorgeous focal point. Treats. Along with the heart-shaped cookies, treat your guest to finger sandwiches and a healthy, but pretty salad. Offer lots of refreshments like gourmet rose lemonade and a selection of delicate teas to sip on during brunch. Roses are the theme of the day, so rose lemonade seems to be the perfect drink at this gathering. Vintage Charm. A great way to set a memorable table is to add interest with some of your favorite vintage accessories. At this table, we’ve included dainty pink stemware, rose-embellished antique china and a treasured teapot set. 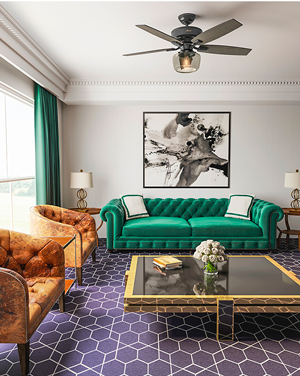 It’s important to juxtapose these classic elements with more modern ones for a fresh look. 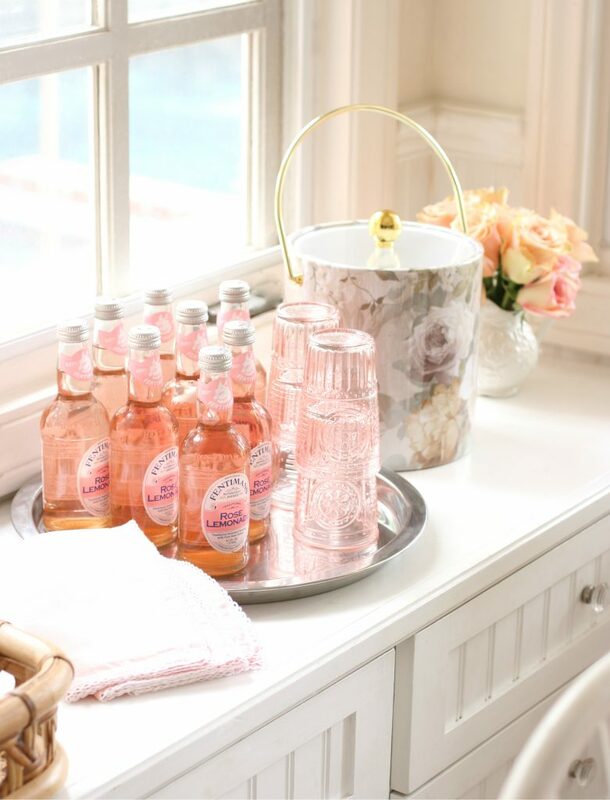 Create a “lemonade stand” station with individual bottles of pink lemonade, pretty glasses and container for ice. Natural Elements. Round raffia placemats and a pretty bamboo tray from Serena & Lily add the perfect dose of texture to our feminine table. I really like how the natural textures compliment the floral motifs and make each place setting pop. 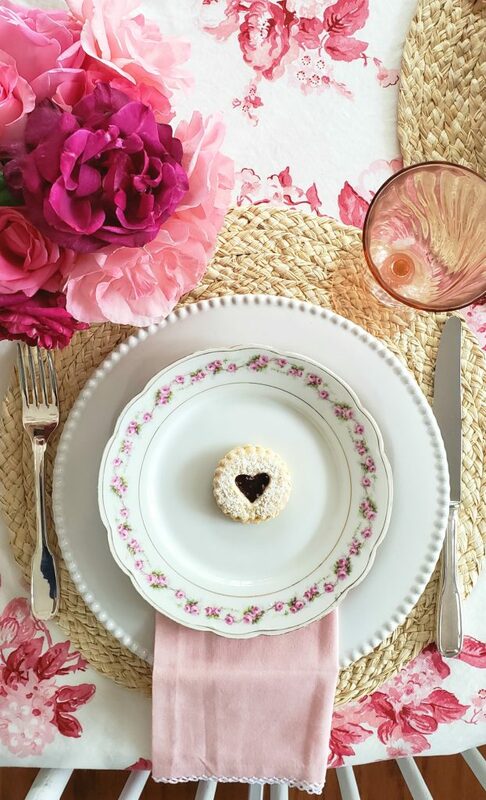 This intimate table is set simply, but with bold patterns and lots of feminine pink accents to celebrate this day of friendship. Brunch and a Tea Party! I love to combine two of my favorite dining occasions into one fantastic weekend event. The relaxed atmosphere of brunch and the ladylike charm of a tea party is the best way to celebrate ‘Galentine’s Day’ with your friends. 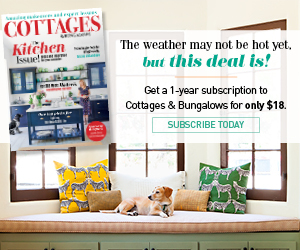 Looking for other easy entertaining ideas? 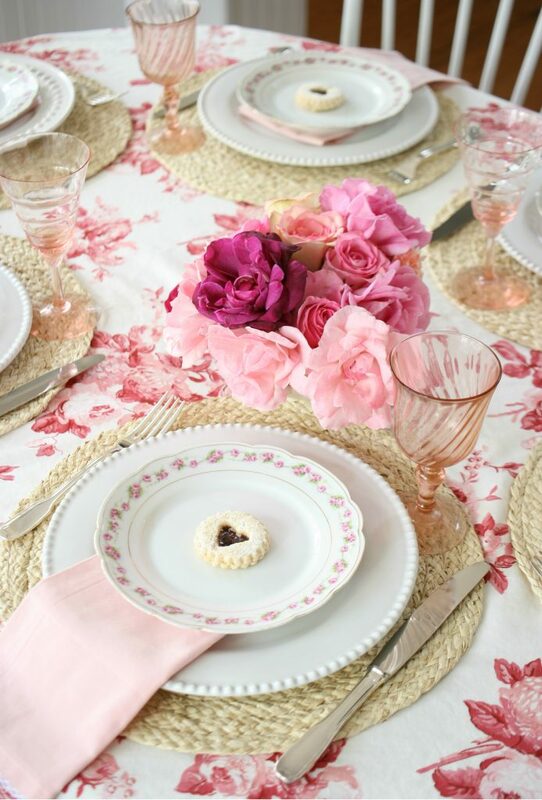 Check out this post on setting a romantic table with Limoge or this vintage-inspired easter party.